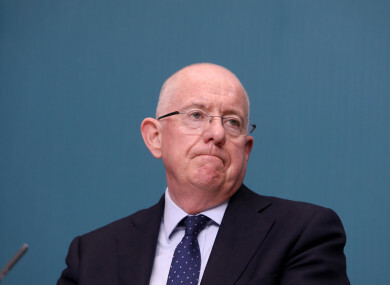 MINISTER FOR JUSTICE Charlie Flanagan has said the incident in which a fully-loaded submachine gun belonging to a member of An Garda Siochána found in Dublin city centre by a member of the public is “a matter of grave concern”. As first reported on TheJournal.ie, the gun was handed in to Store Street garda station yesterday by a member of the public. “It is a matter of grave concern. I’m very concerned about this issue, how it might have happened, how it did happen,” Flanagan told RTÉ Radio One’s Today with Miriam O’Callaghan. It is believed that the gun was an MP7, a compact submachine gun described by its manufacturer as being designed to “be carried like a handgun yet capable of rifle-like effectiveness”. The gun was being used by a garda who was part of an armed unit involved in ongoing criminal investigations in Dublin. The incident did not involve personnel involved in the operations surrounding this week’s royal visit. The gun was in a bag in the boot of a car which was part of a convoy travelling at high-speed through Dublin city centre when it fell out of the car. It remains unclear whether the boot of the car had been closed properly or whether it malfunctioned. The MP7 is used by gardaí who are part of the Special Detective Unit, the Emergency Response Unit and the Regional Support Units; however, it is understood that the gun was not one issued to the ERU, the highly-trained tactical unit of the gardaí. A senior garda officer has been appointed to examine all the circumstances relating to an incident involving an armed unit in Dublin city centre today. With reporting by Christine Bohan and Sinead O’Carroll. Email “'Matter of grave concern': Justice Minister on Garda submachine gun found in Dublin city centre by passerby”. Feedback on “'Matter of grave concern': Justice Minister on Garda submachine gun found in Dublin city centre by passerby”.